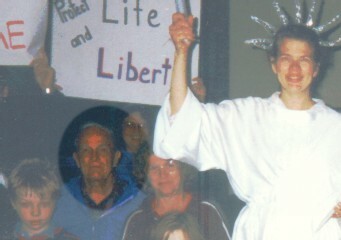 Clare Aldrich at the Liberty March for the Chinese refugees (at the Lerdo jail in 1996). call from a man who asked if he could meet us in a dark parking lot. He offered no explanation for his request, so we were a little apprehensive, but we showed up anyway. The mysterious man handed me $200. Then he walked away. That was our first of many encounters with Clare Aldrich, a man of few words, but deep faith. Clare joined us for the Liberty March for the Chinese refugees in 1996 (he and our son Andrew were the only ones who were able to make it the entire 13 miles without interruption), and he even traveled across country with us in 2000 when we went to St. Louis for a week of ministry with Operation Save America (although dealing with a van full of our children was more challenging than he had anticipated). 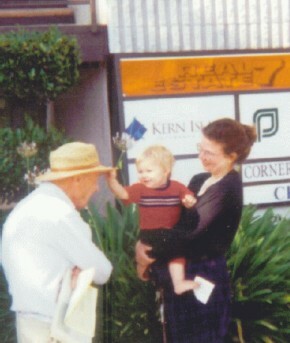 Clare Aldrich with Terri and Christian outside Planned Parenthood (about 2000). Even after he suffered from a crippling stroke which paralyzed one of his arms, he continued to stop by once a month, walking to the LifeHouse to hand us some cash, then turning and saying “bye now” as he went on his way. We would offer him a ride home, but he would refuse (even though we promised not to bring the kids)-- he was fiercely independent and did not want to burden anyone. Sadly, last month our friend Clare passed away at the age of 87. His obituary in the Bakersfield Californian not only mentioned the Bronze Star he was awarded in World War II and his work on the Apollo missions and the Space Shuttle, but it also mentioned his support for LifeSavers Ministries (though his support usually went to us personally). We are humbled that Clare considered us to be an important part of his life, and we look forward to the opportunity to celebrate with him someday in heaven.